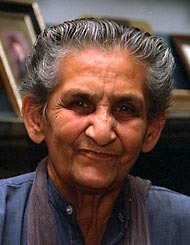 Princess Abida left Bhopal in 1949, disgusted by the violence she had witnessed. Like millions of people in India and Pakistan, forces she could not control brought her to a new country. Yet unlike many refugees, and despite the palaces she left behind, she sees things from both sides. She welcomed the birth of Pakistan, yet understands how much this demand alienated the Hindu majority. A devout Muslim - who could always interrupt an interview for prayers - she firmly believes in secular democracy and women's rights. In the 1960's, she campaigned with the sister of Pakistan's founder, Fatima Jinnah, against a torrent of stones for democracy. As for modern civilization, it amuses her: "People have become vulgar robots, just after money." The rest of this section includes Realaudio sound clips of Princess Abida, illustrated with old photographs. There is a video clip about the Prince of Wales. A 20 page interview, from a series with Princess Abida made in the early 1990's, is also available and easily printed. Princess Abida lived in Karachi, Pakistan after leaving Bhopal. She unfortunately passed away on May 11, 2002. These were her first extended published reminiscences.